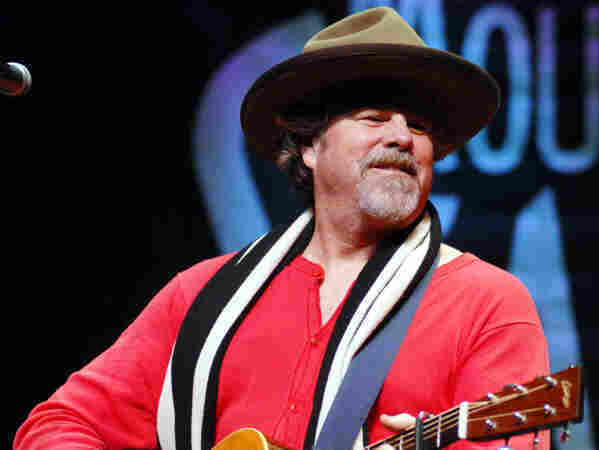 Robert Earl Keen On Mountain Stage The singer-songwriter and his band perform songs from their latest studio release, Rose Hotel. Clad in red long johns for Valentine's Day, Keen makes his ninth appearance on Mountain Stage since 1989. Robert Earl Keen on Mountain Stage. Singer-songwriter Robert Earl Keen makes his ninth appearance on Mountain Stage since 1989 with songs from his latest studio album, Rose Hotel. Keen's set features his longtime bandmates Rich Brotherton on guitars, Bill Whitbeck on bass, Tom Van Schaik on drums and Marty Muse on steel guitar and keyboards. Danny Barnes, heard later this week, guest-stars on banjo. This segment was recorded in Charleston, W.Va., on Valentine's Day 2009. Never one to take himself too seriously, Keen emerged on the stage wearing his red long johns, proclaiming, "I like to get in the mood." "Flyin' Shoes," by Townes Van Zandt, gets the full-band treatment, as Keen honors one of his mentors and predecessors. "The Man Behind the Drums" is Keen & Whitbeck's tribute to Levon Helm, inspired by an invite to Helm's Midnight Ramble in Woodstock, N.Y. Keen shows his humorous side with "Wireless in Heaven," wherein a coffee shop becomes a "metaphor for life." This segment originally ran April 19, 2010.